Voter registration effort kicks off in KCK – Welcome to Wyandotte Daily! In Kansas City, Kansas, Brian McClendon today discussed a new app, KSVotes.org, that is being launched to help voters register. While today is the voter registration deadline to vote in the Missouri primary, Kansans still have one more week before their voter registration deadline in order to vote in the Aug. 7 Kansas primary election. Today area voter registration organizers met in Kansas City, Kansas, to launch a weeklong effort to encourage voter registration and voter engagement in Kansas, but especially in Wyandotte and Johnson counties. Eligible Kansas residents who want to vote in the upcoming Aug. 7 primary election must be registered to vote by July 17. Voter engagement participants said they want to ensure that Kansas residents can make their voices heard and it starts with registering to vote. “Registering to vote in Kansas should be as efficient as using Google Maps to find your way home,” McClendon said. He demonstrated how eligible Kansas residents can register to vote at home or on-the-go using KSvotes.org online or by using the app on your phone or tablet. It only takes three to five minutes to register to vote in Kansas using the non-partisan app. 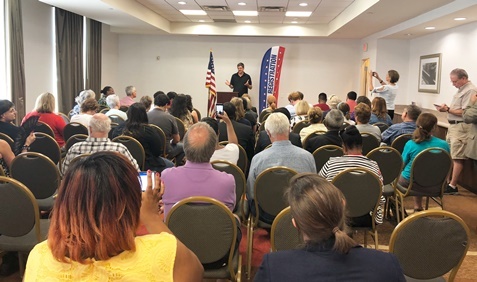 Today’s non-partisan voter registration and training event was launched with the help of Let America Vote that supports voter rights, and The Voter Registration Project, whose mission is to register all the applicable voters across Kansas and Missouri. 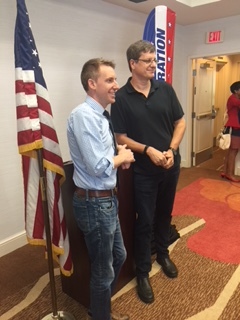 Jason Kander, left, and Brian McClendon today helped launch a voter registration effort.